I’m writing today because you’re a source in our Public Insight Network and you’ve told us that you live in Northfield. We’re working on a series of stories that we think you might be able to help us with. 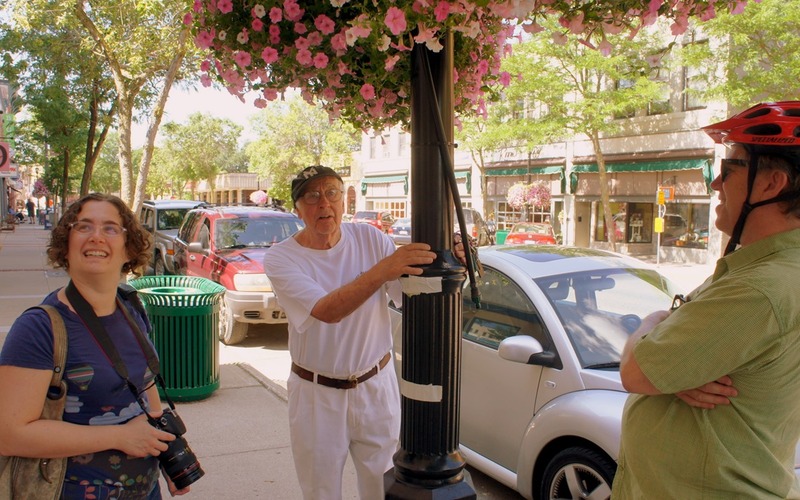 MPR News is been doing a series of stories called “Get Out There,” in which we profile Minnesota towns (you can see them here). 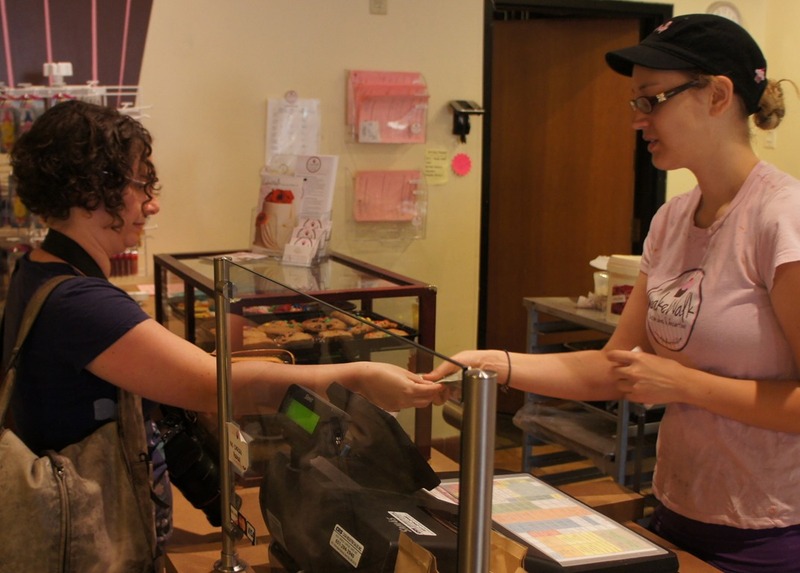 We want to find the places, eateries, and activities that might be hidden gems. So we’re coming to you to see what you think people should see, do or eat when they’re in Northfield. If friends were visiting from out-of-town, where would you take them? Please tell us here. 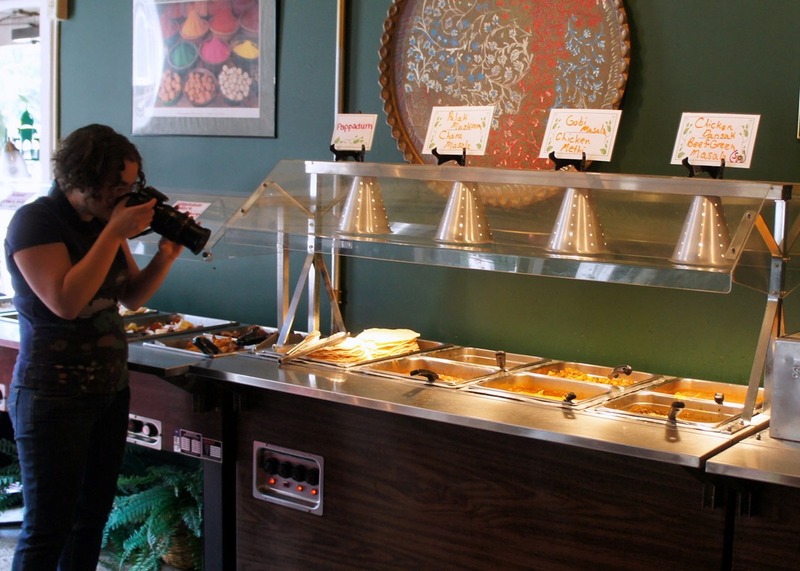 Molly heard from 35 Northfielders and graciously let me follow her around yesterday while she visited some of the recommended "hidden gems." I promised that A) I wouldn’t make any suggestions on where she should go; and B) that I’d try not to get in the way like I did the last time a public media journalist visited. 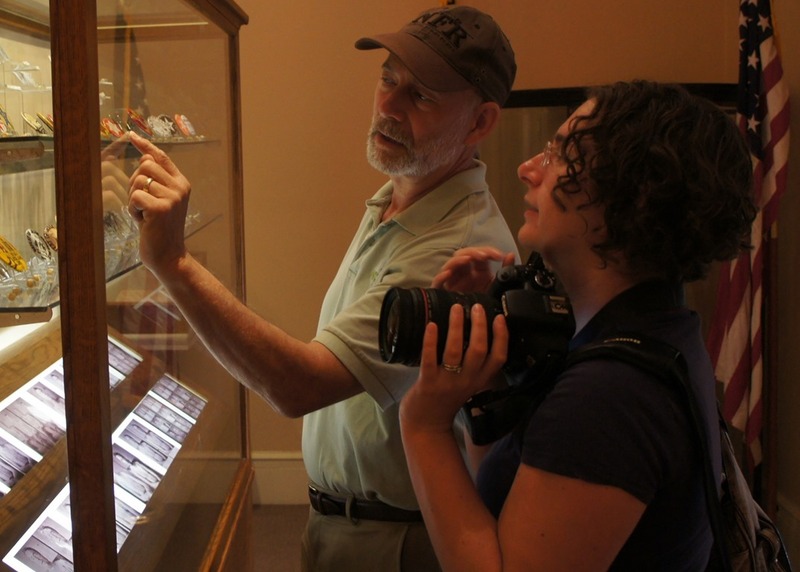 Her first stop was the Northfield Historical Society where Chip DeMann, Hayes Scriven and Brad Ness tried to impress her with, what else, lots of old stuff. 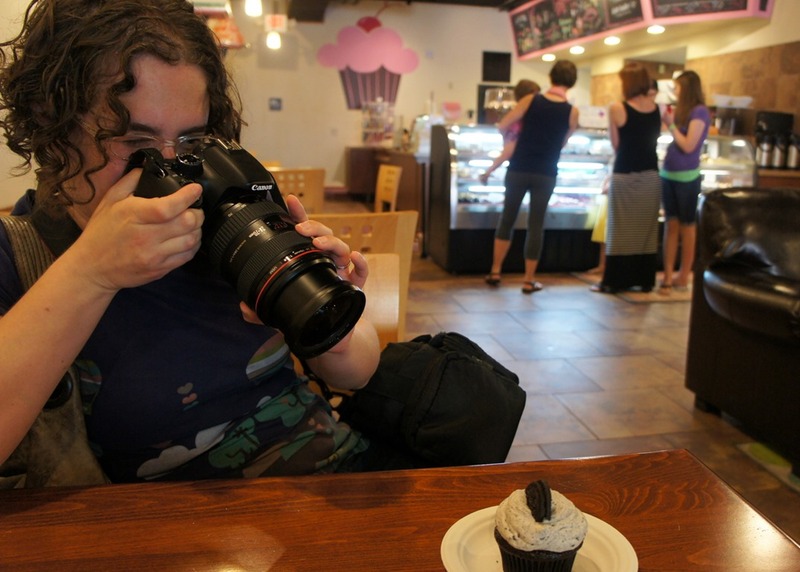 After a quick couple of photos at the NAG, she bought a cupcake at CakeWalk and forced me to eat half of it. 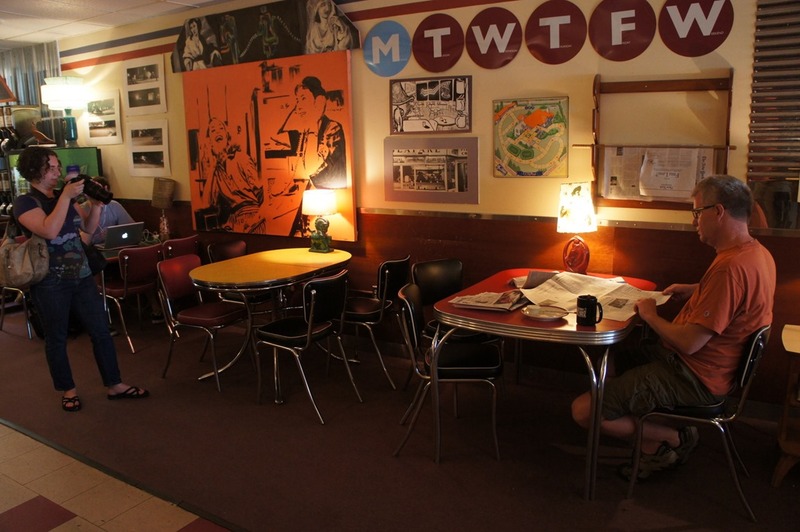 She chatted with Catherine Dominguez at GBM and took a photo of Nathan Nelson reading newspapers there, a quaint activity that they probably don’t see much of any more in the public media empire. 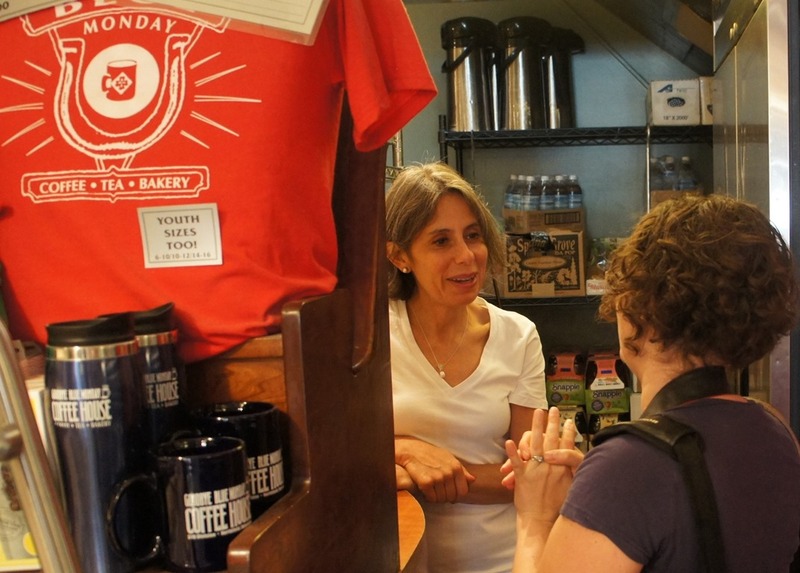 After a visit to the Weitz Center (alas, closed for the summer), she had lunch at Chapati, and then ventured–no further stalking by me–to the Brick Oven Bakery and the Northfield Farmer’s Market in Riverside Park. She also was witness to how much I get abused by the citizenry on a daily basis, courtesy of Victor Summa and Paul Hager. 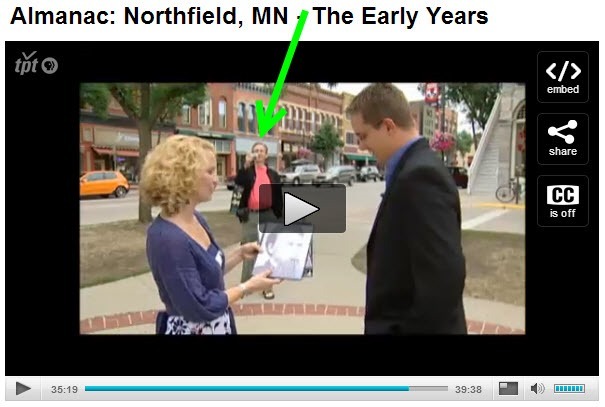 Her story should appear on the Get Out There blog on Thursday, at which point, I invite y’all to chime in here with your suggestions on the other places/hidden gems of Northfield that she should also have profiled. 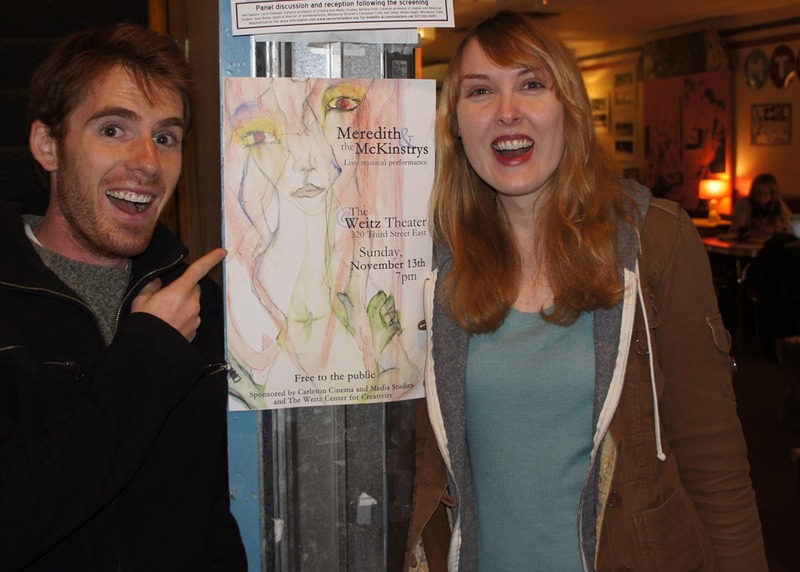 Meredith Fierke, Dylan McKinstry, and Steve McKinstry performed at the Carleton Weitz Center Theater last night. 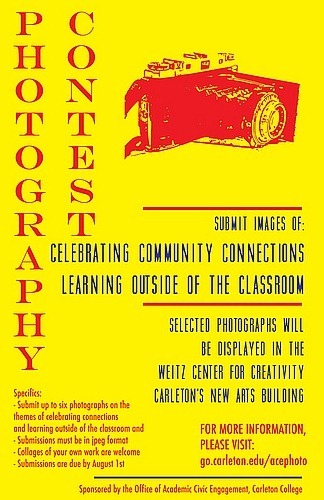 Hi Griff, I wanted to let you know about a cool event that we’re putting on next week. 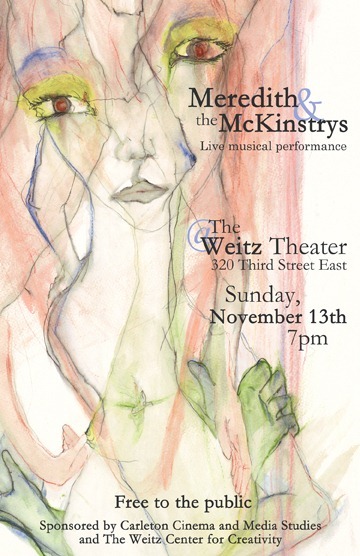 I’m performing alongside Meredith Fierke and Steve McKinstry at the new Carleton Weitz Center Theater on Sunday, November 13th at 7 pm. We are the first local artists to have a significant spotlight in the new space, and we, along with Carleton, are hoping to use it as an invitation to the community to come see the new building, and see local musicians play. So I arranged to meet him and Meredith Fierke at GBM yesterday for the requisite photo op. 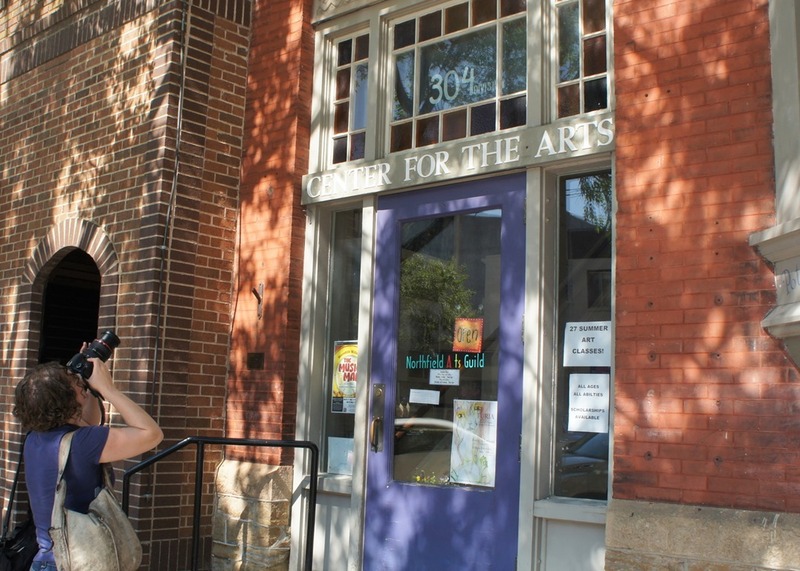 For details on the free 7 pm performance on Sunday Nov. 13, see Jessica Paxton’s well-written blog post on Northfield.org: Meredith Fierke & The McKinstrys to Perform in Concert at Carleton College Weitz Center for Creativity. It’s a really important topic, and a very cool film. And an amazing set of panelists for the discussion afterwards, to boot! Let me know if you have questions. Jessica stopped by my office at GBM this morning with her daughter Astrid for the requisite photo op. 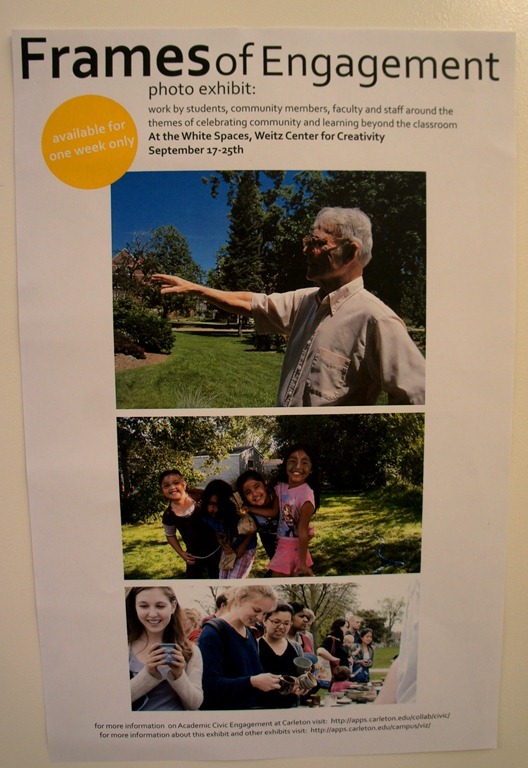 This summer, Adrienne Falcon, Director of Academic Civic Engagement (ACE) at Carleton College, invited members of the community to submit photos "on the themes of celebrating community and learning beyond the classroom for the first Carleton exhibit on Community Engagement in Rice County." 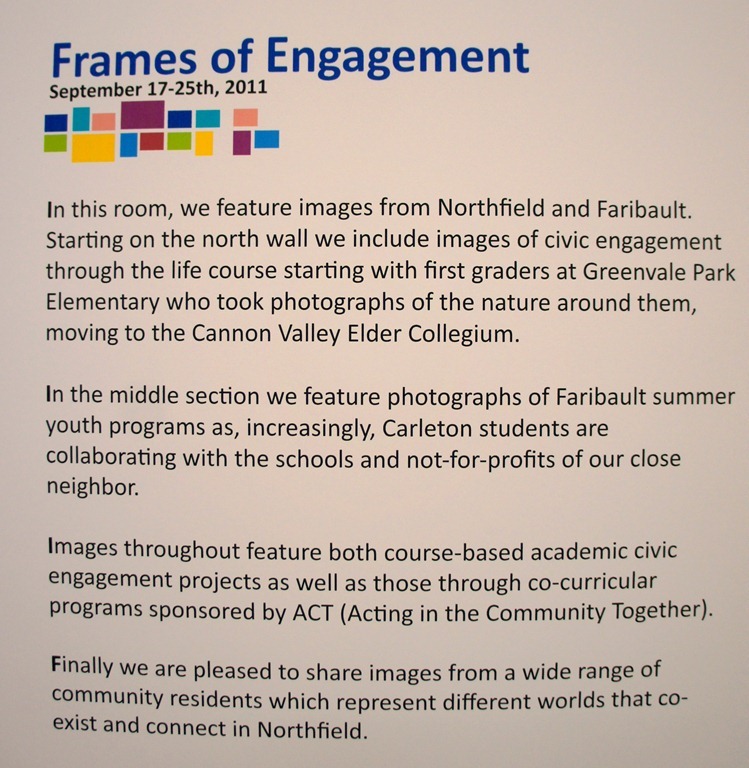 The selected photos are now part of an exhibition called Frames of Engagement that runs through Sept. 25 in the White Spaces at the Weitz Center for Creativity which opens to the Northfield community today with an open house, 3-6 pm. 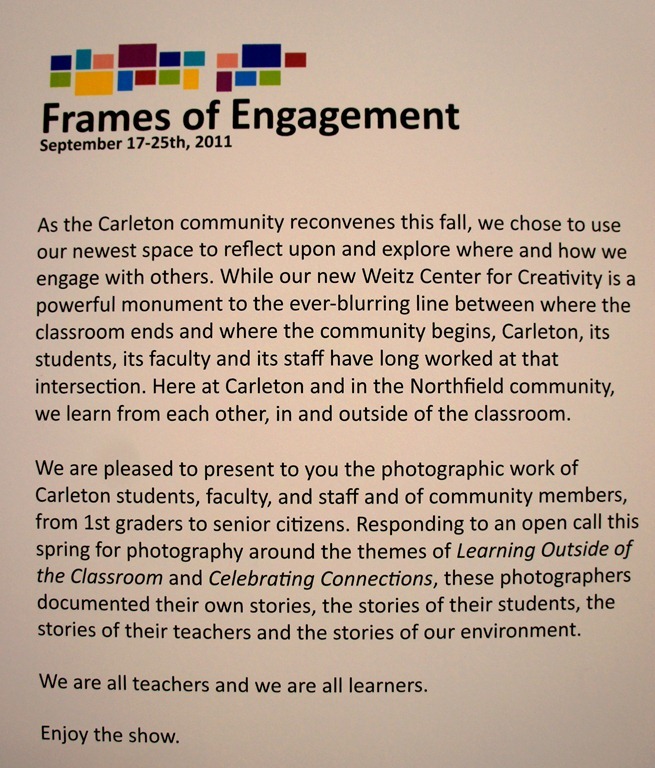 This exhibition highlights civic engagement between Carleton, the Northfield community, and beyond. 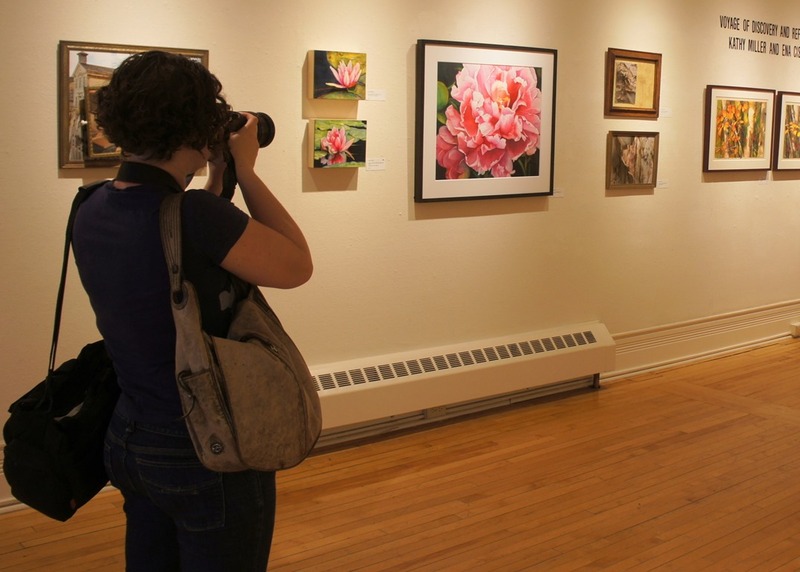 Situated in Northfield’s former middle school, this exhibition demonstrates Carleton’s desire to preserve and commemorate elements of the community’s past while also offering it a vast arena for future collaboration and connection. 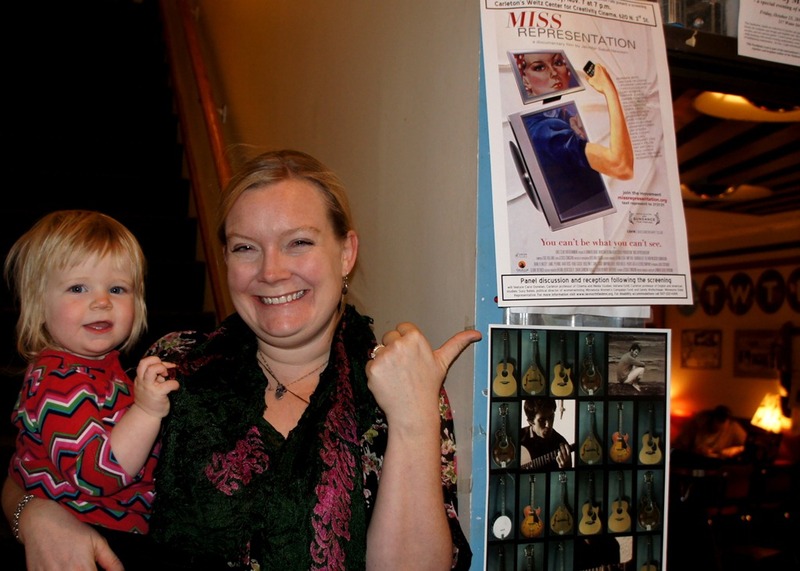 I submitted six photos and when I visited the exhibition last night, was delighted to find out that they were all on display. I’ve added the originals to this album of photos of the walls of the exhibit. … a facility geared toward creative collaboration that will support multiple student and classroom projects and allow faculty members to teach with words, images, sounds, and narrative in a variety of media. 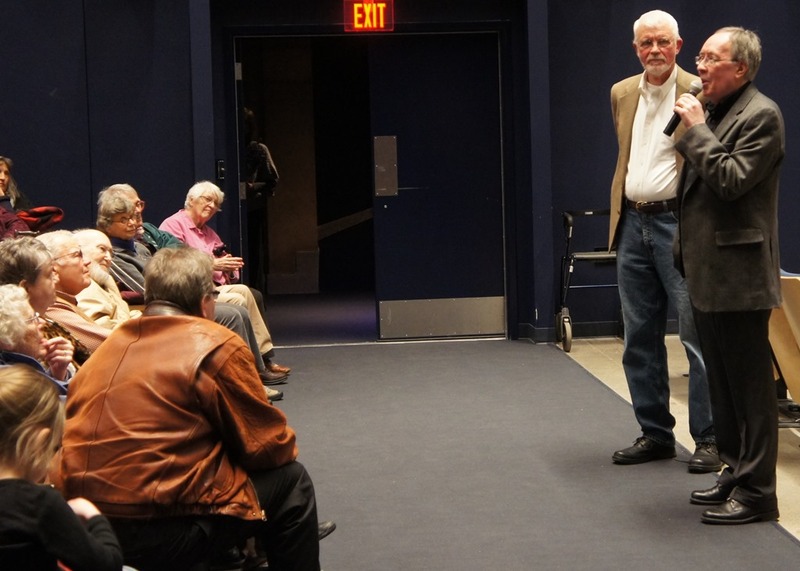 In addition to housing the departments of Cinema and Media Studies (CAMS), and Theater, and Dance, the space will include a teaching museum, a dramatic theater, a cinema theater, dance studios, classrooms and a coffee shop. 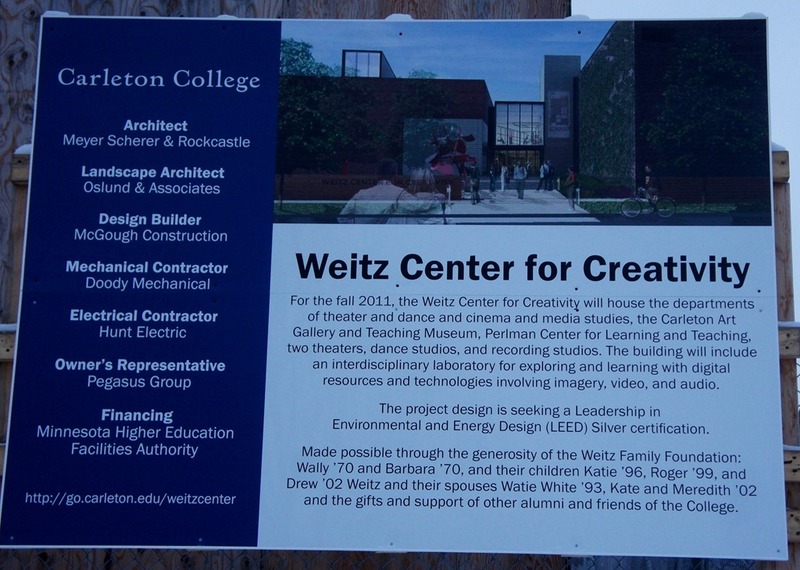 The building will also be home to the Presentation, Events and Production Support (PEPS) office and the Idea Lab, a shared, interdisciplinary laboratory for exploring and learning to use technology. 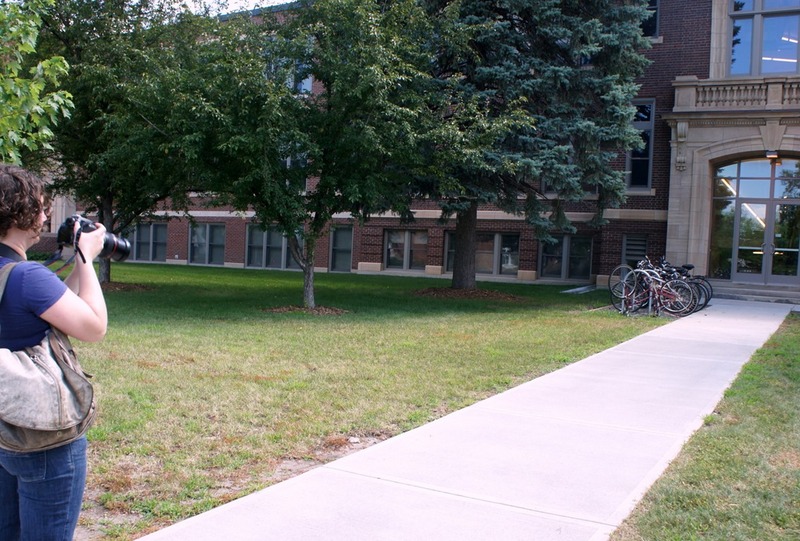 The first phase of construction is scheduled to be complete in Fall 2011.